The other morning I was pumping gas into my Prius when I saw a beautiful chicken hanging around the door of the gas station convenience store. She had brown and black feathers with white specks like snow had just lightly fallen on her back. 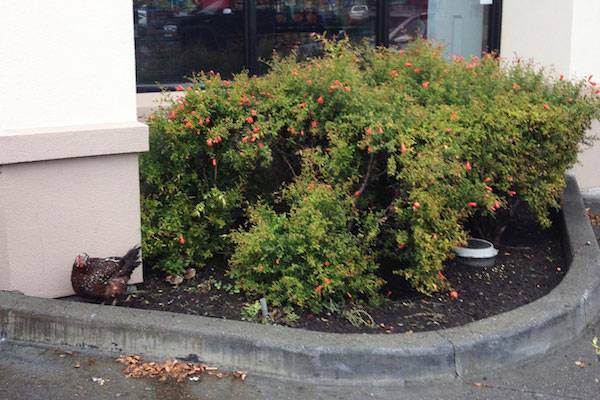 As I looked closer, I saw that this hen had several tiny chicks in the bushes behind her right outside the door of the gas station store. I looked around thinking this was an unusual (and unsafe) place for her to hatch her clutch as there was nothing near that small square patch of bushes but concrete, cars, and a busy road. 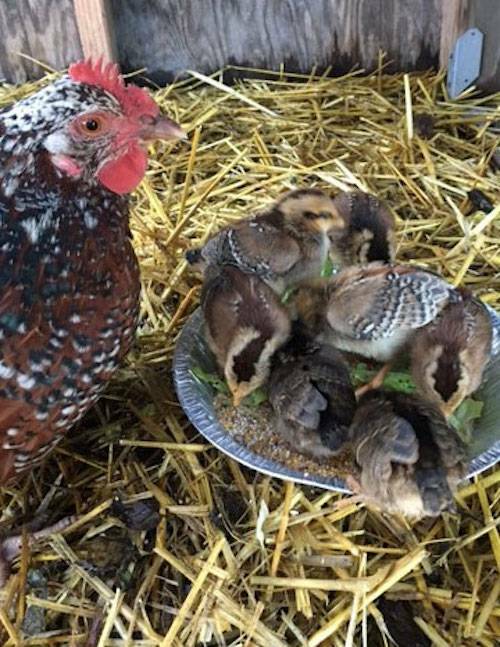 I asked the store workers who said there were eight chicks when they first hatched, but now there were only seven. As the cold drizzle started to fall, darkening the color of the concrete, the hen puffed out her wings a bit and the babies huddled under her for protection. I knew I couldn’t leave them there. I started making calls. My friends Melanie and Russ Walker dropped everything and were at the gas station within a half hour with an animal crate and towels. I had been sitting near the mama hen working on getting her used to me. We bought sunflower seeds from the store and fed her a few. She was coming right up to me as I was talking to her. I got my hands near her as she was pecking at a seed and quickly gripped her and gently put her into the crate. Next it was all hands on deck snatching scattering, peeping chicks! We quickly gathered all seven and put them in with mom. A new farmed animal sanctuary in California called Goatlandia agreed to take the feathered family. 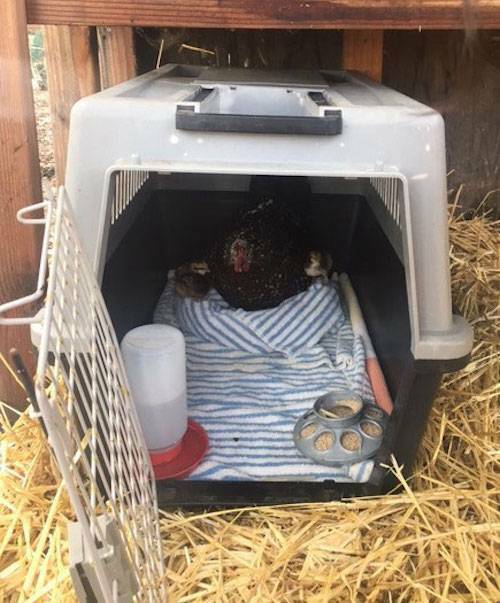 Deb Blum, the founder of Goatlandia, has been caring for not only goats, but rescued pigs and a flock of a couple dozen chickens on her land in North Santa Rosa for many years. I was so grateful that she agreed to take them, and right away too. After we got the crate in my car, I headed directly there. When I arrived at the sanctuary, Deb was preparing a small coop in a separate area, but near the chicken runs. She fluffed fresh straw on the ground and I helped her clean water and food dispensers and fill them. She prepared a large dog crate and lined the bottom with towels and then took a bulky towel, rolled it up, and formed a circle with it in the back of the crate. Deb knew just what she needed because as we coaxed the family out of the travel crate and into the larger dog crate, mama knew exactly what to do with the nest of towel. She immediately gathered her brood under her and settled down on the “nest,” seeming right at home. The next day, a storm rolled into our area with a steady, cold rain and I had a smile on my face all day thinking about that little feathered family and how they were now safe, warm, and dry. Eight lives are now out of harm’s way. It was a good day. A huge thank you to Melanie and Russ Walker for quickly coming to the rescue and to Deb Blum for taking them in! Hope is the author of The Ultimate Betrayal: Is There Happy Meat?